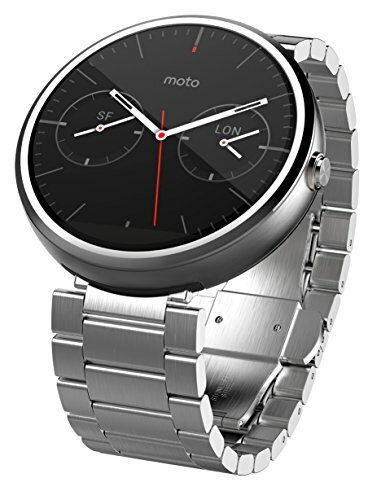 Moto 360 is a modern timepiece powered by Android Wear. Comfortable, familiar, and crafted with the finest materials, Moto 360 keeps you up to date without taking you away from the moment. Glance at your wrist to see updates or just speak to get the info you need. Because it's time a watch told you more than just the time. features a 1.56" LCD touch screen that displays alerts from your compatible Android device. A Bluetooth 4.0 interface helps simplify wireless pairing. Product Features Quality craftsmanship Finely crafted with stainless-steel, genuine leather from Horween and scratch-resistant Corning Gorilla glass. Responds to your voice Just speak to get the info you need using the dual microphones. K. Doubles as an activity tracker Track your steps and heart rate with a built-in pedometer and heart rate monitor. Works with your Android phone Pair with most smartphones running Android 4.3 or higher. Bluetooth 4.0 technology Pairs with your smartphone through the latest Bluetooth technology. Sensors Include a pedometer, an ambient light sensor and an optical heart rate monitor (PPG) for versatile use. Mobile notifications Let you view alerts from your device simply by looking at your wrist. A vibration option provides discreet alerts. Built-in microphone Allows clear hands-free communication. 1.56" LCD touch screen With Corning Gorilla Glass 3 construction, 320 x 290 resolution and 205 pip makes navigation simple and clearly presents visuals. Stainless-steel case With a plastic case back and a leather watch band creates a stylish, yet durable, design. All-day battery Go all day and recharge on a dock at night. 4GB internal storage and 512MB RAM Help ensure fast, efficient performance. What's Included: •Motorola Moto 360 Smart Watch for Android Devices 4.3 or Higher •Wireless charging dock •Wall charger •Quick-start guide.For any further queries please contact Motorola's Customer Support Number 1-800-734-5870.